Brett Cook creates objects, experiences, and feelings that defy classification in any single discipline. His work has been shown at museums and galleries since 1991, concurrent with a practice manifested in public projects since 1984. The public works have been executed in the United States, from California to Maine, and internationally in Brazil, Barbados, and Mexico. His public collaborations include a South Central Los Angeles project addressing divinity; the Development/Gentrification Project installed in ten locations throughout Harlem; and a project addressing segregation at the Harvard Graduate School of Education. While some of his work has been commissioned by museums or public agencies, others have been self-initiated interventions on abandoned spaces. Cook has completed scores of these contemplative projects, often through an interactive and collaborative process. 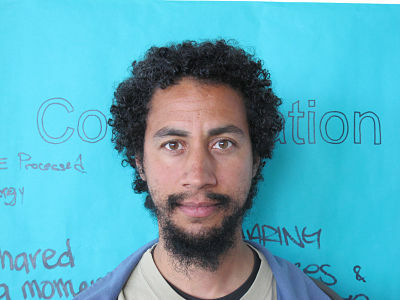 His use of participatory ethnographic strategies, progressive educational pedagogy, and community organizing connect his work to exceptionally wide audiences. He is a seasoned Ashtangi and student of many forms of yoga, meditation, and healing, which inform his process and products. Cook’s work in museums and galleries can take a variety of forms, with a recurrent emphasis on painting, drawing, and photography. His museum work frequently includes elaborate installations that make intimately personal experiences universally accessible. His gallery installation work regularly includes documented participatory public projects, using a wide variety of media to retell the stories of transformation that occur through a process of social collaboration. Cook’s solo exhibitions include Revolution and Multifaceted at P.P.O.W. Gallery in New York and Meditations at the Zilkha Gallery/Wesleyan University. Group exhibitions include Portraiture Now: Framing Memory at the Smithsonian Museum National Portrait Gallery; Social Studies/Brown V. Board of Ed. 40th Anniversary, University of Illinois Urbana-Champaign; Community Interactions, Wayne State University Gallery, Detroit Michigan; and Hip-Hop Nation, Yerba Buena Center for the Arts, San Francisco, California. Cook’s teaching practice is an extension of his public collaborations and similarly involves diverse communities in dialogue to generate experiences of reflection and insight. He has taught at all academic levels in a variety of subjects, and published in academic journals at Columbia and Stanford. Cook received a B.F.A. from the University of California at Berkeley and has had many residencies, including at the Skowhegan School of Painting and Sculpture in Maine; the Studio Museum in Harlem, New York; and the Headlands Center for the Arts in Marin, California. Cook was the Lehman Brady Visiting Joint Chair Professor for Documentary Studies and American Studies at Duke University and the University of North Carolina at Chapel Hill for Spring 2008.